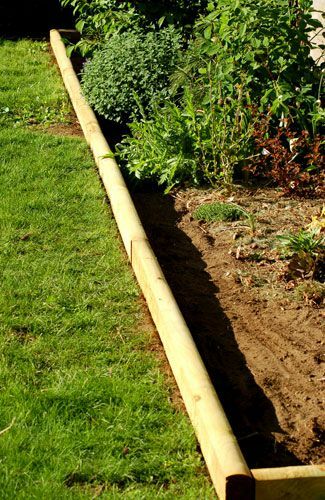 Landscape timber edging is easy to install and creates an attractive, natural-looking frame for a flower border or perennial flower bed. Landscape timbers come in a few different shapes. Some are square-edged, like a fence post; some are almost oval in shape and have two wide flat sides and two narrow rounded sides; some have rounded sides but are more square in overall dimension, and some have square bottom edges and a rounded top. All landscape timbers should be pressure-treated to prevent premature rot due to ground contact. Tie one end of ​a string around an edging stake. Drive the stake into the ground at one end of the border planting. Walk to the other end of the border planting, then tie the string to another edging stake. Pull the string taut and line it up exactly where you want the edging to run, then drive the second stake into the ground. Prepare the ground at the edge of the border planting so that it is ready to receive the landscape timber edging. Use a shovel, a steel rake, or a garden hoe to dig out rocks, roots, and other obstructions along the edging's path. Walk over the loosened soil to pack it down. Add soil if necessary to bring the area up to the proper level, then pack it down again. Make sure the soil is firmly packed to prevent settling. Check for level as you go, using a carpenter's level or a straight board. The ground does not have to be exactly level according to a level; it must be flat and level with the surrounding area. Cut one full-length timber to make the two "returns" for the ends of your border planting. It is easiest to use a miter saw to cut timbers, but you can also use a hand saw or a reciprocating saw. Join each cut return piece of timber to a full-length timber, using a galvanized metal corner brace and galvanized screws, to form a right-angle corner. The braces should be on the inside of the corners. Position each corner assembly at one end of the border planting so the long leg of the "L" is aligned with the string. Lay out straight timbers between the two corner assemblies. If the final straight piece will be shorter than 2 feet or so, shift the timbers so that they are centered between the corners and the two straight end pieces will be cut to roughly equal lengths. Mark one of the straight end pieces for cutting and cut it to length. Join the cut end piece to the adjacent corner assembly with galvanized mending plates and screws. Do the same to connect the remaining full-length timbers along the entire run. When you reach the other corner assembly, measure for the end piece and cut it to length, then join it to the adjacent timbers. If desired, secure the timber border to the ground by drilling 3/8-inch holes through the timbers and pinning the timbers to the soil with 12-inch lengths of #3 (3/8-inch-diameter) rebar driven with a hand sledge. Remove the stakes and string to complete the project.